Home / News / RSU hopes to ban pro-life protesters from Gould St.
RSU hopes to ban pro-life protesters from Gould St. The Ryerson Students’ Union (RSU) has had enough of the pro-life demonstrators who have been protesting on Gould Street throughout the fall semester. Now, they are looking for a way to permanently evict them. For several weeks, an anti-abortion group has been returning to Ryerson’s campus with large banners and posters showing graphic images of abortions. But the Ryerson community has rallied in a counter-protest of the group at every event. RSU president Obaid Ullah says that the disturbances haven’t been an issue in the past because the space is usually booked by student groups. But now, the RSU is trying to get the third-party protesters off campus streets. 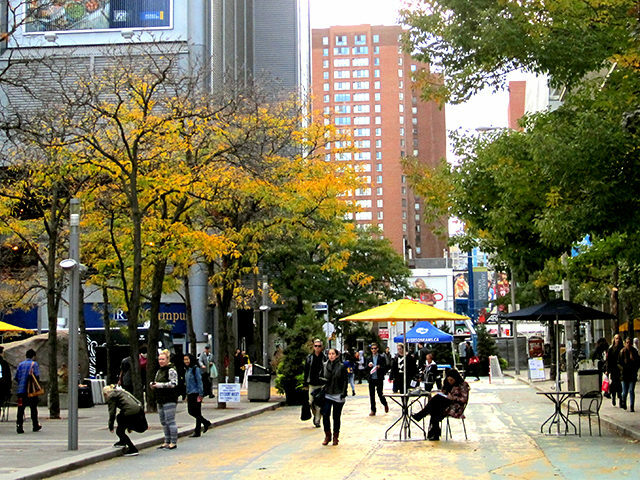 Despite the success of the “Close Gould Street” campaign five years ago, there are loopholes that prevent total control of what happens on the street, resulting in Ryerson security and Toronto police being unable to legally evict protesters from the premises. For the RSU, this means that they have no legal right to kick pro-life groups off the street because the university doesn’t own the infrastructure. This has led to anger among some people in the Ryerson community. At one of the recent protests, Continuing Education Students’ Association of Ryerson (CESAR) president, Rabbia Ashraf, tweeted that Ryerson is anti-woman because the administration and security at the university know about the protesters and aren’t doing anything. However, the RSU is working towards long-term solutions. Jones is spearheading the campaign to gain control and will be meeting with Ryerson’s president, Mohamed Lachemi, this week to see if closing those loopholes is a possibility and can be achieved in the 2016-17 school year. Lachemi said he would be happy to discuss this matter with the RSU, but there is little that can be done. This is because Gould Street is not owned by the university, but the city. Organizers of the protest say they are prepared to defend themselves if actions are taken. “This is a typical response of those who dislike the message of human rights for the pre-born…silence a debate that some do not want to have. As always, we will consider legal action if we feel it necessary to protect our right to spread our message,” said Jonathon Van Maren, communications director for the Canadian Centre for Bio-Ethical Reform. For now, the RSU is exploring short-term solutions to combat the disturbances on campus through continued counter-protests to block the graphic images and educate students. Current recommendations include hosting pro-choice events on campus to raise awareness and explain how images shown by the anti-abortion groups can be inaccurate and misleading. Megan is a fourth-year journalism student at Ryerson University and a reporter for the 'Sonian. Her interests include pop culture, fashion, tuition, security and technology.